The match was conducted on Saturday, 24 January, 2015 at Gelora Bung Karno Stadium, Jakarta, and was attended by more than 25,000 loyal fans from both Indonesia and Japan. 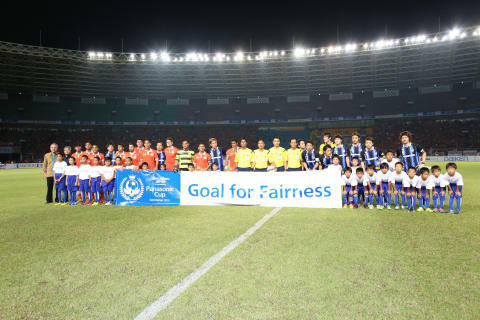 With 'Goal for Fairness' as the theme of the game, the intention for the sponsors was that through the game, the relationship between two countries would strengthen and universal sportsmanship nurtured. With over 20 GAMBA Osaka top players competing, the match ended in a 4-0 victory for GAMBA Osaka. Although having lost the match, PERSIJA Jakarta players admitted that this friendly match was the perfect vessel for knowledge and skill transfer between the two teams to further boost players' capabilities. 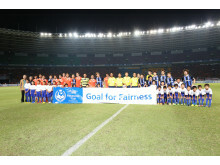 Prior to the match GAMBA Osaka representative also handed over 10 solar lanterns to IBEKA, an Indonesian-based non-profit organization, as part of the team's CSR activities and contribution to the groupwide 100 Thousand Solar Lanterns Donation which would be distributed to remote areas in Indonesia. 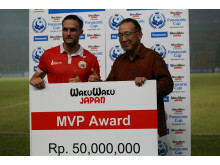 Waku Waku Japan commemorated the MVP PERSIJA player with special prize of IDR 50 Million while Panasonic celebrated the achievement for 'Goal for Fairness' to a GAMBA Osaka player through the award of a LUMIX camera. Aside from conducting a friendly match against top players, Panasonic and GAMBA Osaka also committed to nurturing young football athletes through GAMBA Osaka Coaching Clinics. While previous clinics had been conducted, a day after the friendship match, GAMBA Osaka players led a coaching session attended by 60 children between the age of 10 to 12 years old. 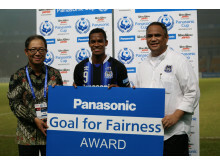 As the most preferred sport in Indonesia, Panasonic believes through the excitement of sports and also grassroots activities such as football clinics, young football enthusiasts will be inspired and become the skillful players of our future. Panasonic Sponsored Gamba Osaka Football Club Secures Domestic Treble!